February is a month known for its holiday celebrating matters of the heart. Therefore, it is fitting that this month would see the announcement of an appropriately themed astronomical discovery - a celestial object that beats like a heart. Astronomer Charles Lada of the Harvard-Smithsonian Center for Astrophysics (CfA) and colleagues have discovered that the dark molecular cloud known as Barnard 68 seems to pulsate like a heavenly tribute to Saint Valentine. "We studied Barnard 68 to find out if it was rotating, expanding, or contracting," says Lada. "Instead, we found that this molecular cloud appears to have a heartbeat." Barnard 68 is the only molecular cloud known to pulsate in this manner. 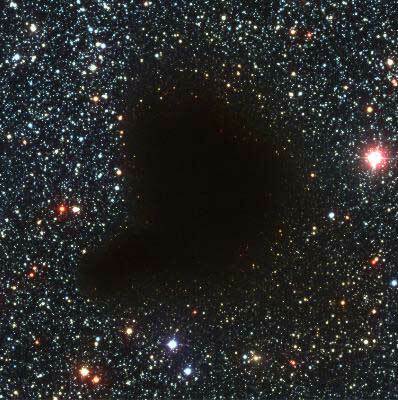 Barnard 68, located 300 light-years away in the constellation Ophiuchus, is a typical example of small, dark molecular clouds known as Bok Globules. Such dense, cold clouds of dust and gas appear black in photos because the dust blocks visible light from background stars. Molecular clouds are stellar nurseries. Young stars form from collapsing molecular clouds. Barnard 68, however, is a stable cloud containing no newborn stars. Barnard 68 holds as much material as one and a half Suns, chilled to a temperature of only 10 degrees above absolute zero (-440 degrees F). It is one of the coldest objects in the Universe. Appropriately for such a frigid temperature, it pulsates very slowly, considerably more slowly than the heart of an earthbound lizard on a cold fall morning. Barnard 68 spans about 12,000 times the average distance between the Earth and the Sun, or about one trillion miles. If our Sun were placed at the center of Barnard 68, the cloud would extend out to 300 times the orbit of Pluto. Our solar system would be a lonely place, because the cloud's thick dust would obscure light from the surrounding stars and galaxies that fill the cosmos. Our night sky would be as black as coal, showing only the occasional pinpoint of light from the other nearby planets. While its composition is typical of molecular clouds, its motions make Barnard 68 unique. By studying it with the IRAM 30-meter radio telescope in Spain, Lada's team found the signatures of both infalling and outflowing material at different locations across the face of the cloud. The complex pattern of motions cannot be explained by simple rotation, collapse, or expansion. Instead, the outer layers of Barnard 68 must be pulsating like a wiggling bowl of Jello. What force could have struck Barnard 68 to make it ring like a bell? Lada speculates that the shockwave from an exploding star may have smacked into the molecular cloud in the relatively recent past. The blast from a supernova easily could provide the impulse that started these pulsations. This theory is supported by other observations showing that Barnard 68 is located inside a hot "bubble" within the interstellar medium - a rarefied zone cleared out by a supernova. The supernova shockwave may even have been powerful enough to rip off the outer layers of Barnard 68, leaving behind the ringing core of a once-massive cloud. Stars like our Sun commonly pulsate. Indeed, there is an entire branch of astronomy called "helioseismology" devoted to studying the Sun's pulsations in order to learn about the solar interior. Molecular clouds are another matter. "Stars are known to pulsate, but clouds are not known to pulsate," Lada confirms. In this respect, Barnard 68 behaves like a star. It shows clear differences from the Sun, but also surprising similarities given the very different environments involved. Pulsations are described by "modes." Each pulsation mode is essentially a sound wave with a characteristic amplitude and timescale. The Sun shows thousands of pulsation modes, while Barnard 68 seems to have only a few. Also, the Sun pulsates on a short timescale of minutes, while Barnard 68 pulsates on a much longer timescale of about 250,000 years. "Still, it's remarkable that the same equations which describe stellar structure and pulsations also apply to Barnard 68, even though they're very different systems with different physics involved," says Lada. Lada now plans to examine the handful of other molecular clouds that are close enough for high-resolution observations in order to see if any others show signs of pulsation. The research on Barnard 68 will be published in the March 20, 2003, issue of The Astrophysical Journal in a paper co-authored by Lada, Edwin Bergin (CfA), Joao Alves (European Southern Observatory) and Tracy Huard (CfA).